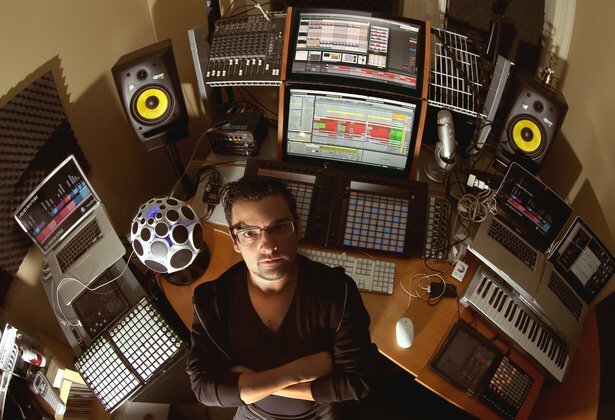 Jason Spanu in his studio. Photo by Christopher Drost. With over two decades as a musician, Certified Trainer Jason Spanu has played many roles: solo musician, DJ, band-member, technical director for the likes of Nelly Furtado and Drake. With current projects including soundtracking a film with his band, and forging new ground with Push, we caught up with Jason to get some of his road stories, essential Live tips, and learn about his unique approach to DJing with Live. “Getting Serious” by DJ Shine aka Jason Spanu. When you’re working with a larger band, what role are you playing with Ableton Live? Generally, the larger the band the more production is involved with the show so the role I play tends to be scalable. I am responsible for programming and editing giant show files that contain many audio and MIDI tracks that facilitate the playback of a mixture of separated studio tracks as well as added material to bring extra production value to the show. So the simple answer is I use Ableton Live to play audio files along with the bands. The role would be 'data librarian' / 'remixer consultant'. It really depends on the artist/band and their needs. Sometimes I do nothing but hit the spacebar and start the song; other times I'm tasked with building mega mashup creations for the artists, syncing video content and generally being a digital swiss army knife. What role are you playing with Ableton Live for your band, Automated Gardens? Automated Gardens is a trio consisting of Keram Maliki Sanchez, Joshua Joudrie and myself. We were more active in the 90's but have still maintained our creative connection - recently scoring some material for the movie Ecstasy. We have been working on a new album for about a year and a half now. We all use Live and reside in different cities / travel so much that it’s impossible for us to just hang for a month and actually compose, so there’s lots of files being transferred back and forth. I’ll tend to start the songs and send them to Keram in Los Angeles for his input, which gets swapped back and forth a number of times before ending up with Josh for his flair and mixing vibe. Trailer for Irvine Welsh’s Ecstasy, featuring music from Automated Gardens. You’ve toured both as a solo artist and as part of major tours with the likes of Drake, Frank Ocean and Nelly Furtado. How do you find that Ableton Live adapts to each situation? Well pretty much the main reason anyone is using Live to run these massive tours is stability - stability and flexibility, particularly with regards to spontaneously adapting to changes in the musical form. It’s one thing to bring a computer on stage and hit play and just make your band conform and play along, but when there are unforeseen circumstances that could cause a musical disaster onstage (microphone breaks, someone forgets their part, band needs to loop a section) Ableton Live's ability to operate freeform, or detached from a traditional timeline approach is what it’s all about. So mostly, I find myself being somewhat an audio safety net. With Nelly Furtado, I play an active part as a member of her band onstage, looping and tweaking and interacting with her playback files as well as adding extra synth and sample elements to the show. As well we have a MIDI distribution system that sends program changes for all the other synths on stage as well as supplying MIDI timecode to things like guitar pedals and other effects that would benefit from that kind of sync. We generally also have every song sending SMTPE timecode to a video server for integration with the lighting and visuals for the show. 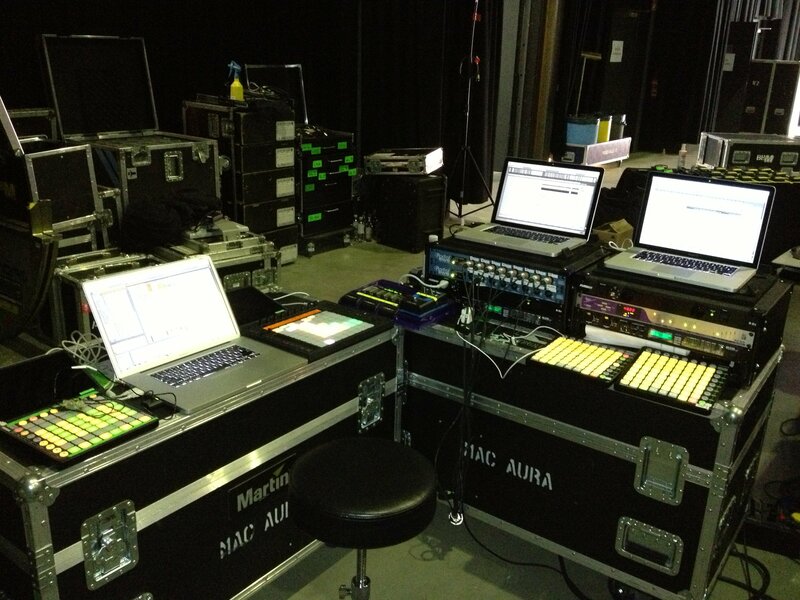 Jason Spanu’s setup for Frank Ocean’s live show. Photo by Christopher Drost. For my own performances I take a radically different approach to using Ableton, often building very elaborate sessions that push the boundaries of what my computer can handle. I enjoy having as much creative flexibility at my fingertips as possible, rather than having just a safe and simple setup. Often times I’ll perform with two identical systems: two laptops, two Pushes, two iPads per station. This lets me "DJ" my live show. I know I could probably just do it all from one machine, but this way I can have one computer dedicated to one task like holding all the songs in my massive live set, while the other computer is more of a spontaneous jamming station, usually with an empty set ready to build vibes on the fly. When you DJ, how do you tend to assemble your sets? Are things more planned, more spontaneous? I tend not to over-plan stuff, but I have noticed a major flaw of digital DJing. Back in 'Tha day' I used to know my records by the cover art or color of the sleeve and instantly know the sound and vibe and what they would mix with. So when I'm using Serato or Traktor or Live I have to rely on the name of the song, which is tough, because often times its some funky obscure European name with lots of letters or something stupid that doesn't register in my mind. To get around that, I color-code the songs (in Clips) based on a little color legend I created. Tech house is purple, tribal house is brown, vocal house is orange, yellow for cheesy tunes and so on… I also try and use shades to describe the intensity or energy of the song: for example, dark purple will be heavy sounding tech house, and light brown would be tribally sounding house with vocals. If you could offer one quick and essential Live/Push tip to anyone reading, what would it be? I use Push a little differently than most. I like to animate the movement of the scale mode with the help of a free control script called ClyphX. Basically, ClyphX allows for the control of certain aspects of Live’s parameters by naming Clips with certain words. One word I use the most is 'pushscl' - which takes a snapshot of Push’s key and scale information and can replay it to Push when triggered. If you repeat that process and then use follow actions that cycle through the various Clips, which in turn trigger the changes in Push, you can simply leave your hand in the same spot and jam some neat results that follow the modulations of scale and key.